« Santander’s Botin Has Advice For Amateurs On Wall St.
Where Is Your Golden Idol Now, Babylon? Isn’t gold supposed to be a haven in times of stress? you know, real money? What happened then? why didn’t gold skyrocket to $2000 oz.? if it isn’t going to go up when the world’s financial market is in meltdown, when is it going to go up? The answer deduced from market history is that gold’s role as a safe haven is simply a myth. It speaks to gold’s weakness in this market that it bucked the seasonality trend that I pointed out for the month of September. The AMEX Gold Bugs Index (HUI) - the only index which is comprised of only gold stocks - started and ended September at pretty much the same level. The k-ratio held almost constant, treading sideways for five years as both the numerator, gold stocks, and the denominator, gold prices, kept pace with each other. Because I was using this indicator to time the gold market, I lost some money because I didn’t see a fundamentally attractive opportunity at those prices. While it was painful to watch this historically reliable indicator, it has once again proven its merit. This is probably what people went through when it continued going lower and lower in the late 1990’s and 2000. So what accounts for the collapse of the k-ratio? While gold has fallen around 4% for the year so far, gold stocks have fallen almost 50%! Believe it or not, that’s actually more than the equity market (S&P 500 Index). A large part of this is probably due to the forced liquidation that we witnessed in the markets last week. Ironically, now that gold equity prices have fallen this much, the k-ratio is at levels last seen in late 1998 to 2002 - when the gold price was ~$250! The current gold price is more than 3 times that. 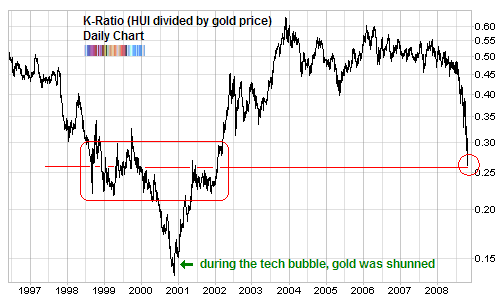 The AMEX Gold Bugs Index (HUI) has strong support at 175, which would mean the k-ratio to the low 0.20’s and once again, it could set up as a buying opportunity. I really don’t think we’ll revisit the lows that the k-ratio set in 2000 because that was due to a huge asset dislocation (thanks to Greenspan’s bubble). I think I’ll follow you on this one! Babak, I think your exemple DO prove that gold has been some kind of haven this year. Gold has fallen by as much as the dollar has gained compared to for exemple the Euro. But even in absolute terms a minus 4 for is “okey” compared to how everything else has gone. Sure, just having cash would have been better, but I still prefer to risk a little premium to have that gold in case hyper inflation comes. None of your studies admits that hyper inflation can be a reality. And with fiat money it will happen some day. I rather be proactive. I think it is lunacy no not always hold a little bit of that real currency called gold. Just as an “insurance” one should always have say 10%. In these days where governments and central banks seems to have lost control I would not hold under 20% in gold and I would be ready to buy more. Disclamer: I am currently holding gold. Your K-Ratio article suggested buying gold — or gold stocks — when the K-ratio is down to .4, as it was last May/June. So now it way below that. So why not buy now? I haven’t jumped in, but I started to look for appropriate vehicles to do so, and I couldn’t find anything for HUI. Do you have any to suggest? Hopefully ETFs? I agree that this gold thing is a big myth, if anything in bad economic times gold values will sink along with other commodities. The K-ratio closed at .23 today and the HUI also closed below support of 175. Unbelieveable, the HUI is down over 50% in once month. With the HUI down nearly 70% below its high of 519.68, do you think it might be a good time to scale in? Tony, I’m still leery of gold stocks. I’m buying Gold for the first time in my life. Seriously. Picked up GLD (Gold ETF) a few minutes ago in the 72s. while Gold is in the 730s. I think it is a great “end of the world” play and might also go up if the market recovers. Seems too good to be true. You may remember I called Gold just another commodity that’s bubble had burst a couple of months ago in the mid 900’s on this website. So that is a pretty sharp change for me. I think getting money out of the bank and putting it in your sock drawer and holding on to Gold might be very popular in the next couple of weeks if this market selling continues. I think these actions are over the top but that doesn’t mean they won’t happen if panic continues. Crazy times and people might get a little crazy.